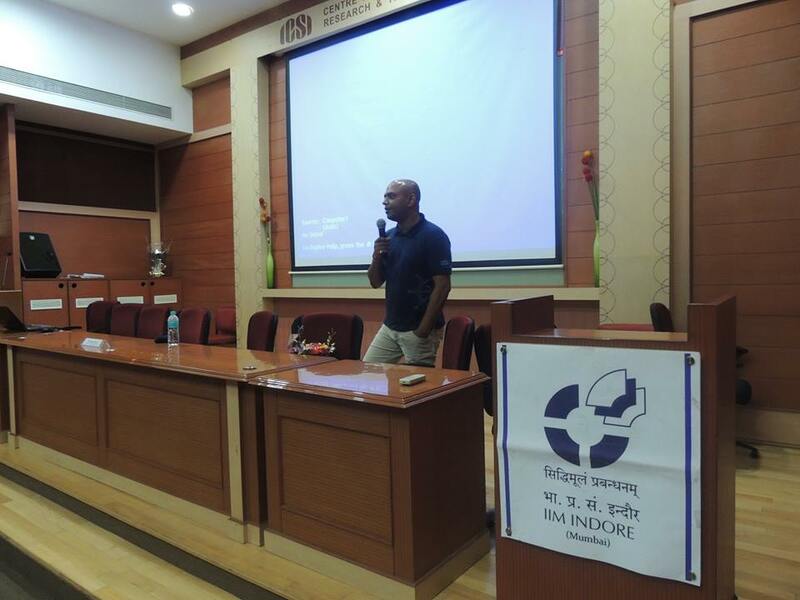 Mr. Bijaei Jayaraj addressed the participants of IIM Indore , Mumbai Campus on 8th Aug 2014. Mr Jayaraj is an alumni of ISB Hyderabad. He has previously worked as AVP of Master Card Advisors and Head of the frequent flyer program at Jet Airways. He has a strong management leadership background with unbridled passion and innovative ideas for Consumer Loyalty & Relationship management business. His firm, Loyalty Rewardz currently runs loyalty programs for a cumulative card base of 233 million credit or debit cards in India, and have processed over 450 million transactions awarding over 11 billion loyalty points.They currently process over 21 million transactions worth INR 3500 Crores per month. Mr Jayaraj spoke about his journey from being an employee to starting his own company. He explained how he saw an opportunity in this domain and decided to deep dive in it by starting Loyalty Rewardz. He cited examples of the various loyalty programmes in India and their revenue stream, thereby explaining the business model of Loyalty Rewardz. While talking about Entrepreneurship in 2014, Mr Jayaraj discussed the hurdles one has to face before having a hold in the market. For an Entrepreneur, it is easy to lose hope and give up but the real challenge lies in facing all obstacles in the face and moving ahead to achieve what one aimed for. The lecture was a great learning experience for the participants in terms of understanding the various aspects of a business.